This photograph was taken by Samuel Bourne in the 1860s. 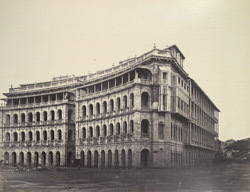 Elphinstone Circle was constructed from about 1860 onwards on the site of Bombay Green in the centre of the Fort area. It lies at the eastern end of Vir Nariman Road, formerly known as Church Gate Street. The elegantly curved, arcaded terraces exhibit unified Italian facades enriched with cast-ironwork imported from England. Following Independence the area was renamed after Benjamin Horniman, an English journalist who was an ardent proponent of Indian self-determination.